This card speaks to me quite a bit as I suffer from trying to control too much. Sometimes letting things go a bit helps you find what you need to be focusing on. Take your time to sniff out what you need to know. Is there some detail or nuance about how you engage others or operate in the world that is key to your success but you’ve too dismissed as “nothing big” or “nothing special”? Mouse Spirit remind you that what seems small may be more important and powerful than you think, so look again. Do not underestimate yourself or your potential for co-creating something amazing when you pay attention to the details! Protection Message: Are you too caught up in details, micromanaging others and stressing out because you want everything to be perfect? Are you procrastinating because you want every detail to be “just right” and losing track of time and your priorities? 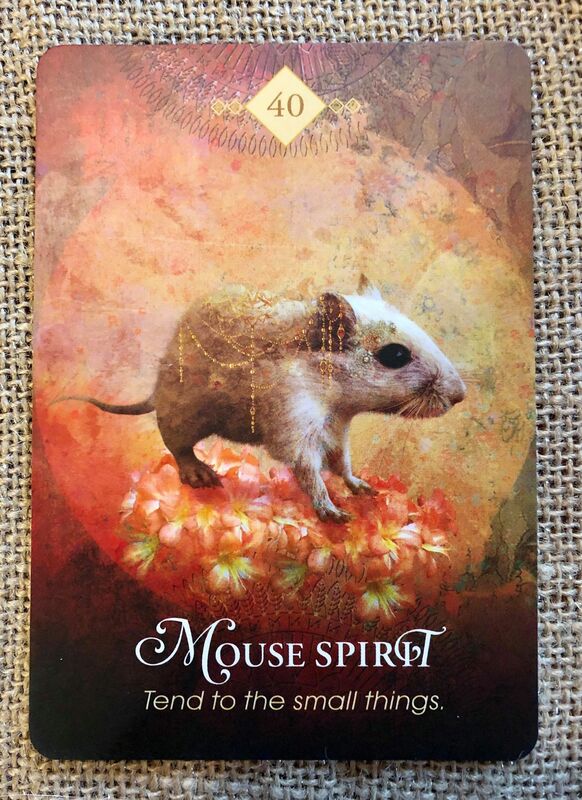 Mouse Spirit wants you to listen to your intuition that tells you that the the detail you fear you are overlooking will only appear when you stop obsessing.